Please read the enclosed leaflet before use. How to take Fybogel Hi-Fibre Orange For oral use. Fill a glass with approximately 150ml (1/4 pt) cold water. Pour in the required amount (see dosage). Stir well and drink straight away. Adults and children over 12 years: Take one sachet in the morning and one in the evening, preferably after meals. Children aged 6 to 12 years: Take half to one level 5ml spoonful depending on size and age, morning and evening, preferably after meals. If there has been no bowel movement after three days of treatment, consult your doctor. Do no take without water. Do not take more than directed. If you are accidentally take more than you should, drink plenty of water. 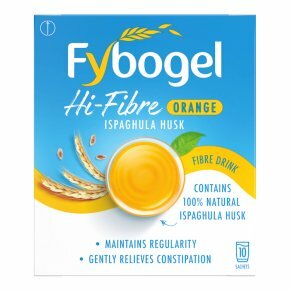 Keep out of the sight and reach of children.<br><br>Before taking Fybogel Hi-Fibre Orange<br>Do not take if:<br>You are allergic to Ispaghula husk or any of the other ingredients.<br>You are suffering from a blockage of the bowel (intestinal obstruction, faecal impaction) or muscle weakness of the bowel wall (colonic atony).<br>The speed in which material moves through your gut has always been slow (naturally occurring reduced gut motility).<br>You are taking any medicines which may cause constipation (e.g. codeine or morphine).<br>Talk to your doctor if:<br>You have phenylketonuria (an inherited genetic disorder) as this product contains aspartame, a source of phenylalanine.<br>Your symptoms worsen or do not improve after 3 days.